The Black Widow is the most poisonous spider in North America, and the Brazilian Wandering spider is the most poisonous in the world—responsible for the most human deaths caused by spiders. However, the spider that is arguably the largest in the world, and which perhaps causes the most fear when we see it, is known as the Goliath Birdeater Tarantula (tuh-RAN-chuh-luh). 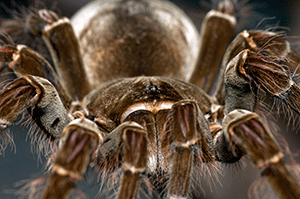 “Tarantula” is a generic name that is given to hairy spiders, and the Goliath is no exception when it comes to hair. When this spider's sensitive hairs vibrate, they alert the Goliath to the presence of prey, since its eyesight is very weak (even though it has eight eyes!). The Goliath can grow to be a foot across and has fangs that are one inch long! It lives in the rain forests of South America, where it hunts at night for its food—usually frogs, small snakes, beetles, cockroaches, lizards, rats, and even bats. However, it received its name because of reports from explorers centuries ago who saw the Goliath Birdeater eating a hummingbird (its first name obviously came from the giant of the Bible that David killed). The Goliath spins a welcome mat of silk at the entrance to its burrow that serves as a motion detector, alerting the spider that something’s come to its doorstep—for dinner! The bite of the Goliath Tarantula, as well as the other tarantulas, is not typically very serious to humans (it is comparable to a bee sting). No human death from the bite of the Goliath has ever been reported. However, it is a very aggressive spider that would not make a good pet. It makes hissing sounds to frighten anything that seems to be a threat by rubbing its legs together. This rubbing motion also brushes off hairs into its enemies' eyes. The Goliath will rear up on its hind legs in a show of aggression as well. The person who does not believe in God would have you to believe that the Goliath Birdeater Tarantula was formed through evolution over millions of years. But common sense tells us that such a thing is not possible. Someone had to give the spider the ability to regrow its legs. Somebody had to give the Goliath its amazing alarm system of hairs that tells it if dinner is nearby. Somebody had to give the Goliath the instinct to make trip wires to warn it if something is at the door. These things require planning. Planning requires thinking. Thinking requires a mind, and evolution does not have a mind. God—the Super-mind behind the Universe—clearly created the Goliath Birdeater Tarantula.